You have compelling titles that persuade customers to click on your products in Amazon search results. 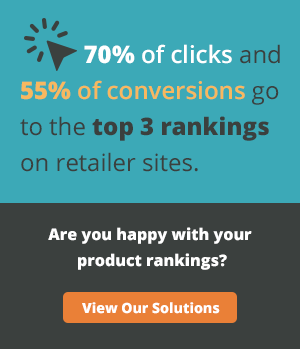 Now you need to turn those clicks into sales. Bullet points play an important role in converting shoppers, especially on desktop, where they appear at the very top of the product page. On mobile, they appear further down the page, after the A+ or Enhanced Brand Content and the product description. 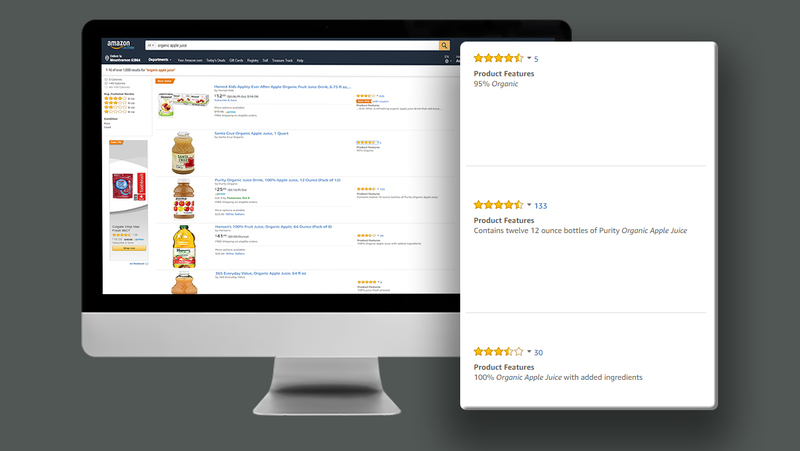 Here are six tips for writing the perfect feature-benefit bullet points on Amazon. Vendors can have up to 10 bullet points per product page, while sellers can only have five. 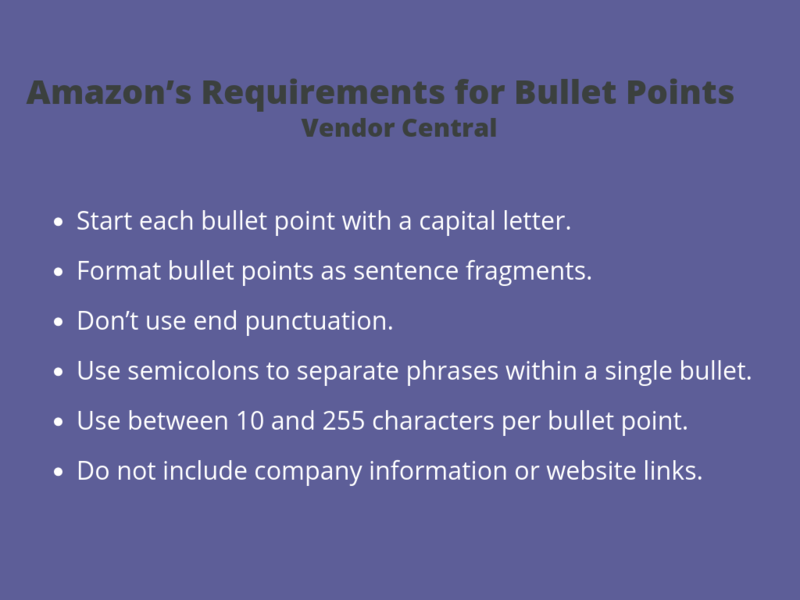 Many vendors are unaware that they can have more than five bullet points, as this is the maximum number allowed on Amazon’s product setup sheets. However, additional bullet points can be added on the “Edit Product” page in Vendor Central. Even though vendors can have more bullet points on a product page than sellers can, they have fewer characters to work with. Typically, sellers are allowed up to 500 characters per bullet point, while vendors can only have up to 255, depending on the category. Bullet points should start with a capital letter and be formatted as sentence fragments with no end punctuation. Use semicolons to separate phrases within a single bullet point. Do not use special characters or all caps for emphasis. This looks unprofessional, and you want your listing to show a quality product and build customer trust. Bullet points are meant for short, easily digestible pieces of information about a product. They should give the customer a snapshot of what the product is, what it does and what is included for the price. Don’t try to stuff every detail in the bullet points; focus on what’s most important for the customer to know. Use short phrases that customers can quickly and easily read, as opposed to long paragraphs; these can be disengaging. Bullet points are indexed for search, which means the keywords included in this section affect a product’s rankings in search results. Additionally, if the keywords a customer is searching for appear in one of the bullet points, Amazon’s search results will sometimes show that bullet point with the relevant keywords italicized. This does not mean you should stuff keywords in the bullet points. Doing so makes them difficult to read and can be off-putting to the customer. Your bullet points must be compelling, coherent, well-thought-out phrases that help the customer, not just a list of keywords. Only include the most relevant keywords that are customer-facing and naturally complement the content. You have plenty of space in the backend search terms to add other keywords. For more details about keywords, take a look at a recent article about the importance of keywords on Amazon. Brands live and breathe their products. This often means that how they see the products is different than how the customer sees them. Brands know their products inside and out, but the customer may be new to them with limited understanding of their features and benefits. To better understand what is important to customers, brands should read the product reviews and customer questions. This will give them insight into the features customers care about most and help them identify any missing information. If the product is completely new with no reviews, take a look at the competition. What are they writing about, and, more importantly, what are their customers saying about their products? Avoid writing things such as “free returns” or “30-day return policy.” Most customers are already aware of Amazon’s return policy, and this is something for Amazon to highlight, not you. Keep your content focused on your product, not your service. The only time you should include detail about your service is if you need include warranty information. If you do, leave it for the last bullet point. Remember that your product may be available from multiple sellers on Amazon. These sellers all share your same product listing page. Therefore, you shouldn’t write about any promotions or special offers that aren’t available from all sellers. What happens, for example, if your content says the item comes with a free sample, but the seller the customer ultimately ends up buying from does not offer this? If the customer is expecting a free sample but does not receive one, they may leave a negative customer review on the listing. Amazon has different sections of content on the product page for a reason. Each section has its own objective. Bullet points are meant for brief, precise pieces of information about the product. Rather than providing shoppers with everything they need to know, the bullet points should focus on the key benefits that are most important to customers. They should get shoppers interested in the product and make them want to read more in the product description and A+ or Enhanced Brand Content.